In life, every 'why' has a 'wherefore' (etiology); this implies that there is an explanation tracing everything/event in life. An explanation of why things are the way they are and why they came into existence. Explanation is the wheel of understanding and understanding determines one’s decision, and decisions channel one's actions to a particular direction. In essence, when you have a wrong understanding, you end up making a wrong decision which eventually leads to wrong actions in a wrong direction. This is why, when people are born, they understand and behave more like their parents, but before they die, their choices in life must have shaped their understanding and behaviour. As a result, it is very essential in life to have a better understanding of the issues of life before taking action especially in the case of the name Ohanaeze-Ndigbo, the Igbo socio-cultural group. This is to save the wider world from Nigeria’s tricking nature, deceits and media hypes and also to make known to the world, the channels the Nigerian government has put in place to propagate these, because the world is too big for such nonsenses. The conducts of a handful group of people in Biafra land called Ohanaeze (organization of Igbo kings), that claimed to represent the Igbo tribe of Biafra, have called for a clarification of what and who they are in relation to Igbo culture. 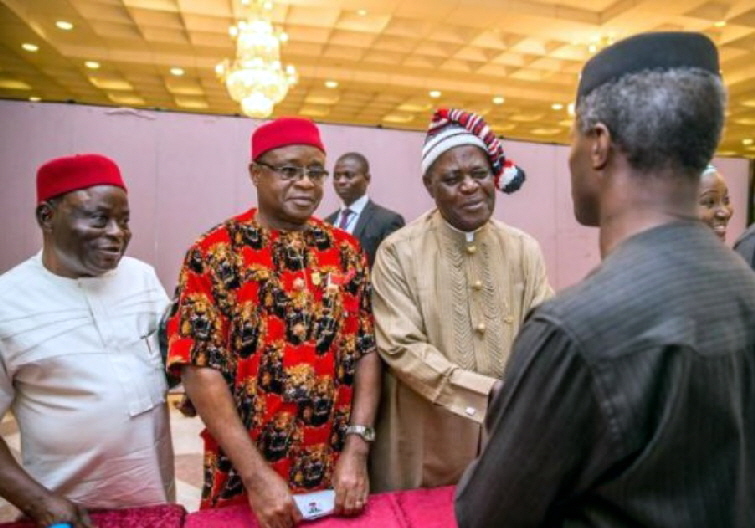 After the Biafra-Nigeria war, a number of the Igbos in a mission to unify their people under one common umbrella body, gathered as a kind of patriotism to form an organizational assembly called Igbo National Assembly (INA). This was as a result of the high displacement of their people during the war and the oppression meted on them. This good group was later banned by the Nigerian Federal Military Government because they were speaking the minds of their people without fear. Then in 1976, another group under the control and manipulation of the Nigerian Government was created as Ohanaeze Ndigbo- a political hand grenade the Nigerian government is using to create more disunity, inflict injury amongst the tribes of Biafra. For Nigerian government to achieve this, they brought politics into the group to manipulate and dictate for them. Politics is a bone thrown to them by the Nigerian government for them to contest for in order to trick them into not thinking about their people and truly speaking, they are fighting over that bone like dogs. How can a group parading itself as the representative of all Igbo communities within and outside the country not have a website? This goes to bare their fraudulent nature. The epileptic approach of Ohaneze-Ndigbo on the recent massacre of Biafrans at St. Philips Catholic Church, Ozubulu in Anambra, Biafra land, is not something that can be swept under the carpet or look at the other way. Just of late, defenseless Biafrans were observing a Sunday Mass when masked gunmen stormed the church and opened fire on them. Many were killed at the spot while a good number of them met their demise as the gunmen were having a shooting spree. News had it that 18 lives were lost and 50 were seriously injured, but the death toll is not yet accurate as Nigerian police came in immediately the gunmen left to dispose some dead bodies. Amidst of all these, the only thing Ohaneze could say is “it is an act on God’’. Who doesn’t know that it is an act on God? In Biafra land, never in history has it been recorded that a Biafran conducted a mass killing not to talk of in the church, never. The Oduduwa (Yoruba) people are also not known for such heinous acts. Haba! You can’t learn how to use the left hand at your old age. It is the Fulanis (northern Nigeria) - a race that has provided the world with Boko Haram and Fulani Herdsmen militia, that are capable of carrying out such heinous act. Ohaneze Ndigbo should call evil by its name and save the people you claim to be protecting. Recall that on 10th July, 2017, in the Arewa Youth press release, Yerima Shettima, the National President of the Arewa Youth Consultative Forum (AYCF), took to the media to say that they will bring war on Biafrans soon by saying, “We’ll take the fight to Nnamdi Kanu’s domain”. They have started with the Ozubulu massacre. The fact is that Ohaneze and the South-east governors are toothless bull dogs that cannot do anything to protect their own rather, based on issuing out calculated and manipulated statements in the media to cover up their cowardly nature. This conduct of Ohaneze-Ndigbo on this Ozubulu massacre I hope, will open the eyes of the Biafrans in the northern part of Nigeria to know that those (Ohaneze-Ndigbo) telling you that the situation (The Quit Notice) has been arrested and that everybody should go about their normal businesses, are leading you astray. Is there any army called Ohaneze Army or South-east Governors Army that will give you protection? No. The security in Nigeria is centralized. Have hope on Ohaneze and be killed. Ohaneze telling you to stay is just to protect their political interests so as to maintain their continued flow of money from the Nigerian Government. From all practical purposes, Ohanaeze to the people they claim to be representing is a fiefdom of old hungry-stricken and opportunists, fighting tooth and nail for political relevance and contracts. Since the blastoff of this group of cabals, there have been cases of unresolved crises within them. This is due to the quest to hang on to power among them. Inner fighting most especially for relevant posts, has been the order of the day for them. Who voted them in is a very good question to ask. The people they claim to be representing never voted them in. How can you say you are representing me when I have not given you the license to do so? Their mission is not far-fetched, they are the Trojan horse of Nigerian government over Biafrans. When their children were fallen by the bullets of the Nigerian murderous army, they desperately lose their voices when its services were highly needed. They stood still, watching the pillaging of their own. Haba! These are kleptomania citizens who have been given a feathered-bed by Nigerian government to help destroy their own people. After all their obnoxious and dishonourable statements against their people in the social media, they have continued partying around with the killers of their own people. You do not need a mirror to know the quality of that which is worn by the hand; Ohanaeze is a hub of villains. They are going for restructuring because they want to harvest political gains out of the efforts of IPOB whose leader is Mazi Nnamdi Kanu. 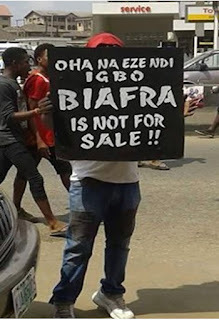 Biafrans are not on the same page with you people. Now they have been disgraced out of restructuring. Whether you like it or not, the north determines what happens in Nigeria because they have more representatives more than the other constituencies. I hope this restructuring saga will drive the final death knell into the stupidity of the one Nigerianists. What is needed in Nigeria is Self-Restructuring (self-teaching). Let it be dawn on us that we were never meant to live together. Nigeria is a historical accident, made possible due to British desperateness to strengthen their own economy. We cannot be living by the outcome (Nigeria) of British move to better their own lives. It is time for Ohaneze to stop whiling away in politics and buckle down with the precious son (Mazi Nnamdi Kanu) Chukwu Okike Abiama has blessed them with, to protect their people. Ohaneze should ask themselves why anytime mass death issues arise in Nigeria, it is always on their people. Your people are angry and tired of your barbaric political conducts. Ohanaeze should be made to understand that there is safety in huge number and Mazi Nnamdi Kanu has the backing of all the Biafrans not only the Igbo speaking Biafrans. Advice yourselves because, he who thinks he is leading and has no one following him, is only taking a walk. A tree cannot make a forest. The earlier, the better. WHO IS DECEIVING WHO ?? YOUR SUPPORT FOR BIAFRA WHO IS DECEIVING WHO ?? Look at them - evil, wicked and foolish men. How did Ndigbo politicians, rulers and elders descend so low to be afraid of illiterate Hausa-Fulani and Yoruba traitors? Is this the impact of civil war or something else? How can these few men want to mortgage the lives of millions of Biafrans who want to be free from the murderous sharia Islamic republic of Nigeria for mere money and meager inducement when the wealth is coming from their land in Biafra? Who has bewitched these men? Tufiakwa. However, no matter what they do, Biafra must be restored. They must not let the millions of Biafra youths in the zoo and diaspora lose their temper. A word is enough for the wise. A SUPPORT FOR BIAFRA NATION IS A SUPPORT FOR TOTAL EMMANCIPATION FOR US ALL,ALSO OUR BROTHERS & SISTERS IN OTHER NATIONS OF AFRICA & EVEN BEYOND AFRICA FROM ISLAMIC SHACKLES & HIDDEN AGENDA(BECAUSE THERE WAS AN OATH TAKEN TO ISLAMISE AFRICA & BEYOND!